Google has offered a look inside the cooling system of one of its newest data centers, in Hamina, Finland, which uses seawater for cooling which runs through existing infrastructure built for an old paper mill. The site is still under construction but according to Google Director of Operations Joe Kava, Google has already found solutions for much of the challenges that have risen from taking from the sea. “The design takes in fresh seawater from the Gulf of Finland,” Kava told the Google Datacenter Summit in Zurich,” Switzerland yesterday. Kava, who will also talk at DatacenterDynamics’ event in Zurich today, said this means Google can minimize any chance of environmental impact when the water is returned. “Technically this was not required but we decided to go ahead and build this temp building anyway,” Kava said. The aim of Google’s summit was to educate smaller data center operators on what they could do to ensure better data center efficiency in future, but Kava warned smaller players off of Google’s seawater cooled approach. “On very small scale might this not be very financial attractive but it does have great benefits. It is a very dependable thermal source – the Gulf freezes over every year,” Kava said. He said once complete, Google expects it will run a low PUE similar to its other EU facilities, which all push the barriers with cooling solutions in the name of efficiency. “Free cooling is very important to us. We believe in it, but there is no one answer. You have to look at what opportunities you have with geography and climate. All three of our systems (I the EU) use 100% different designs,” Kava said. “There was also a lot of existing infrastructure on this site that we could use so we would not have such a large environmental impact on the site,” Kava said. Google made use of a quarter-mile long seawater tunnel that could fit a tractor through it that had already been constructed to deliver seawater to the old paper mill. “It was the intake system for the original mill building and is carved out of solid granite,” Kava said. “We sent robotics through it with cameras and lights and found it to be in excellent condition before we used it,” Kava said. It was not all smooth sailing for Google in the Gulf of Finland, however. IT had to trawl back through 30 years of seawater temperature records, and employ a large amount of thermal modelling to ensure it could cater for the effects of the wind, direction of the tide and ebb and flow as well as sweater temperatures and density of the seawater before it could devise a solution that would work for a data center. It also had to consider seawater’s corrosive properties. “We definitely had some design challenges,” Kava said. “We had to accommodate for the potential fouling of the cooling system and potential breathe that might get into the system. We deployed special materials to accommodate for this. “As you know, seawater is corrosive, so we used fibreglass-reinforced piping and titanium plates in our sea water exchanges. “We have four levels of filtration and screening from course to very fine so we maintain the integrity of the system. 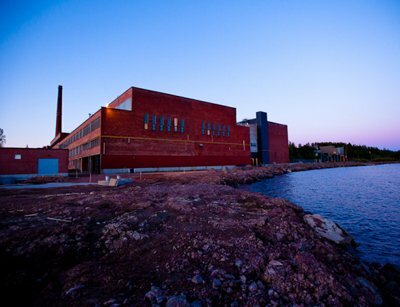 Apart from toilets and drinking, Google’s Hamina site will use no potable water. See Google’s video about its Hamina, Finland data center here.